NOLA Red Dress Run (Saturday, August 10th @ 9:30am) - I'll be a spectator, and likely in a red polo (you don't want to see this in a dress), but I want to check out this "race" at least once. Its more of a party with a light jog; but from what I hear, its one heck of a party. 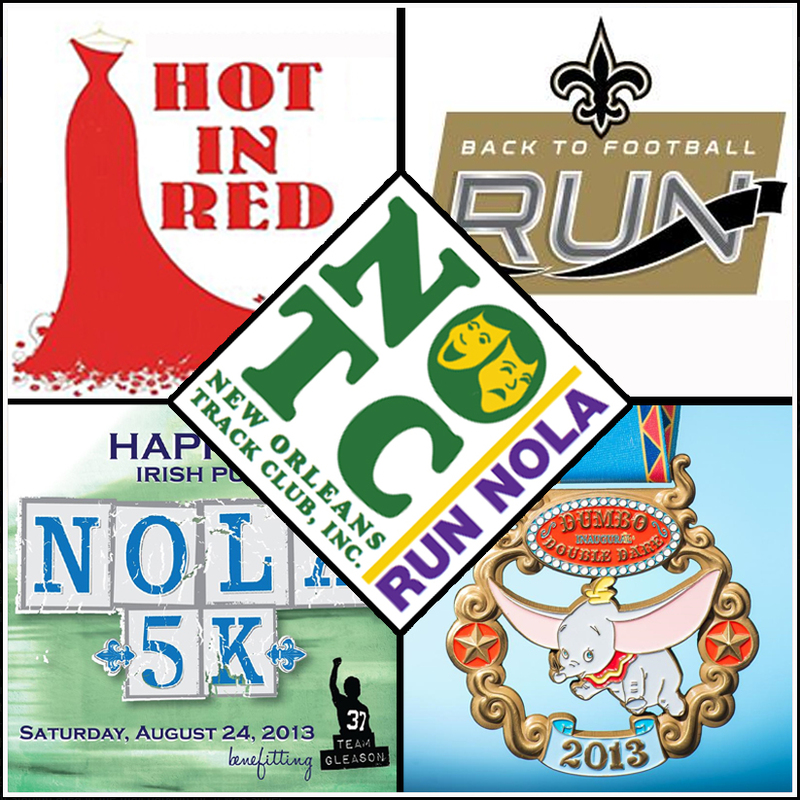 NOTC 50th Anniversary Race (Saturday, August 17th @ 8am) - Members and non-members alike can celebrate 50 years of the New Orleans Track Club for the 3-mile and half-mile races that start and end on the City Park festival grounds. Happy's Irish Pub NOLA 5K (Saturday, August 24th @ 6:30pm) - A 5K course that winds through Downtown New Orleans and ends at Happy's with post race party. All proceeds benefit Team Gleason. Saints Back to Football Run 5K (Saturday, August 31st @ 7:30am) - Celebrate the return of football season with a run through downtown New Orleans and a finish on the 50 Yard Line of the Mercedes Benz Louisiana Superdome. I'll be out of town for this race, but its sure to be a fun time. Disneyland Dumbo Double Dare Challenge (Saturday, August 31st & Sunday, September 1st) - The Disneyland 10K on Saturday and the Disneyland Half Marathon on Sunday make up the Inaugural Dumbo Double Dare. I'll be hitting up the west coast for a weekend of cooler LA weather, theme park rides, and running with Abby and Karen. We'll all also be completing the Coast-to-Coast Challenge after each doing the Walt Disneyworld Marathon this past January. If you're interested in doing some social "cross-training" during the month of August, be sure to check out local events that highlight the local culture. My best picks include the Satchmo Summer Fest from August 1st-4th, Whitney White Linen Night on August 3rd, and Royal Street's Dirty Linen Night on August 10th. Am I missing anything that you may have coming up this month? Leave a comment below with an event I may not have on my radar. So many races in August in New Orleans. That's so weird! Here's hoping it's cooler in CA! When we went before in the summer, wasn't it cool (even chilly) at night? That was July if I remember correctly. I'm hoping that trend continues. It has to be cooler than NOLA though right? I never think of August as a month that has... anything going on, but this post certainly proves otherwise! I'm still on the fence about Happy's. Convince me? It's for a good cause and ... I'll be there. What more do you need? Seriously though, I figure it's a good way to get me downtown early on a Saturday, and I'll stick around for post-race food and "rehydration." Hopefully you'll consider it. Plus, I need to ease myself back in to road-races. I don't think I've competed on a flat, street race course since the CCC10K in April.